My XSR came with a great-sounding Akrapovic twin-pipe system (right). OK, it was pretty scratched, but so was the rest of the bike. For Morocco last year I was expecting the engine’s low sump to be vulnerable so figured better to let a bulkier stock pipe take the beating than the tasty-sounding but skinnier Akrapovic. 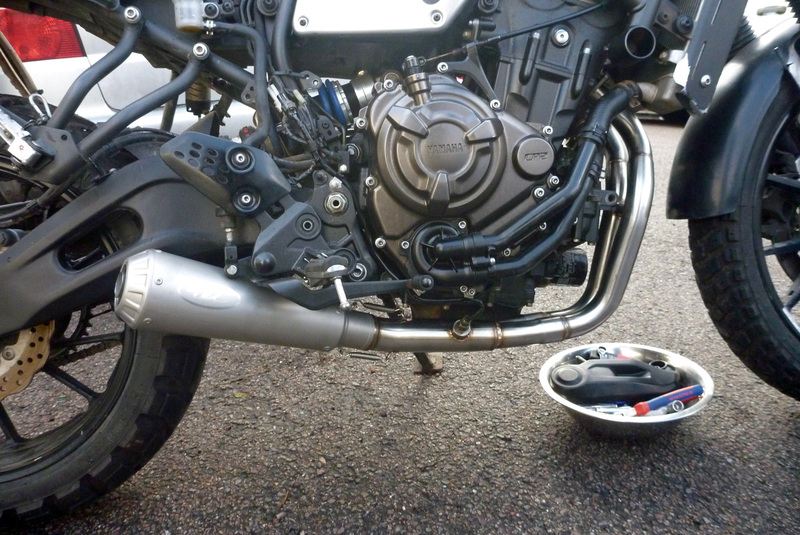 Used stock XSR pipes go for £100. 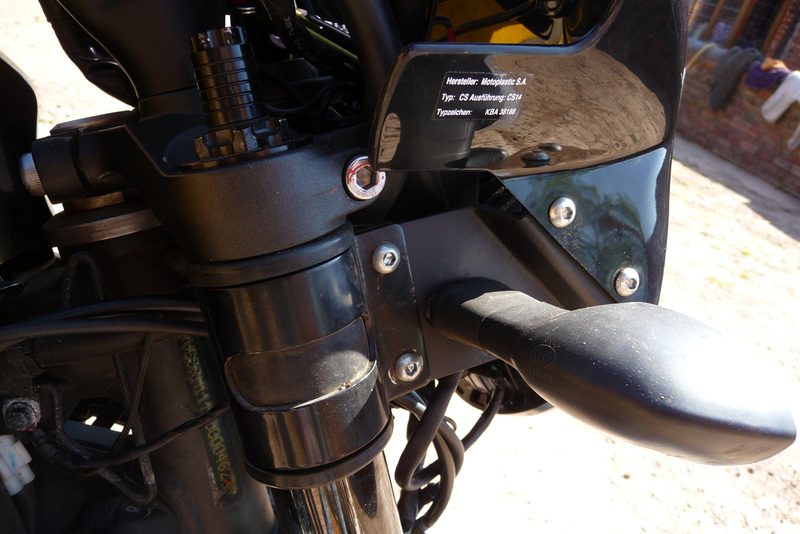 Turns out, thanks to the one-inch lift and the modest speeds I rode in Morocco, the XSR barely scratched the sump. Most of the damage was from flying stones on the front plate of a SW Motech spoiler I fitted (right). The flimsy spoiler doesn’t claim to be a proper bash plate, and as it didn’t do that much I’ve since flogged that too. 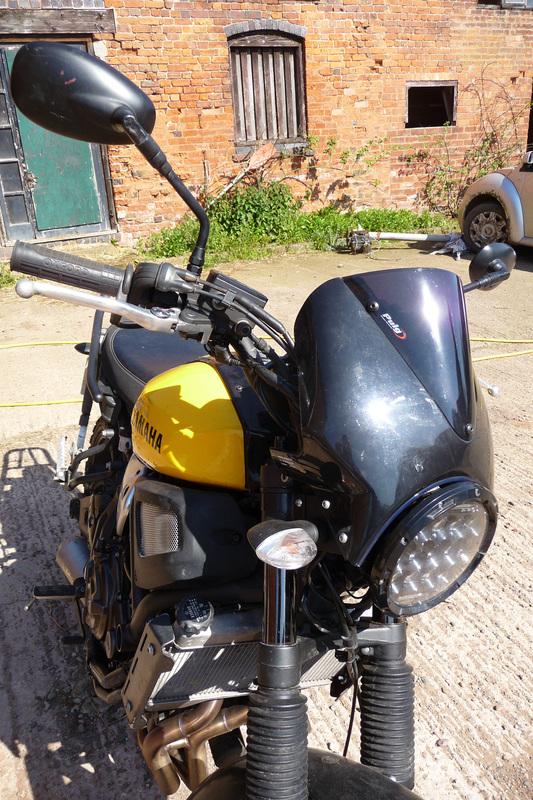 Now I’ve decided to keep the XScrambleR for the Sahara Road Trip I figured it might be fun to unleash some of the engine’s characterful sound with a rorty pipe. Maybe I should have kept that Akra, but actually I prefer a stubby stock-style pipe which keeps the back sides slim for baggage. 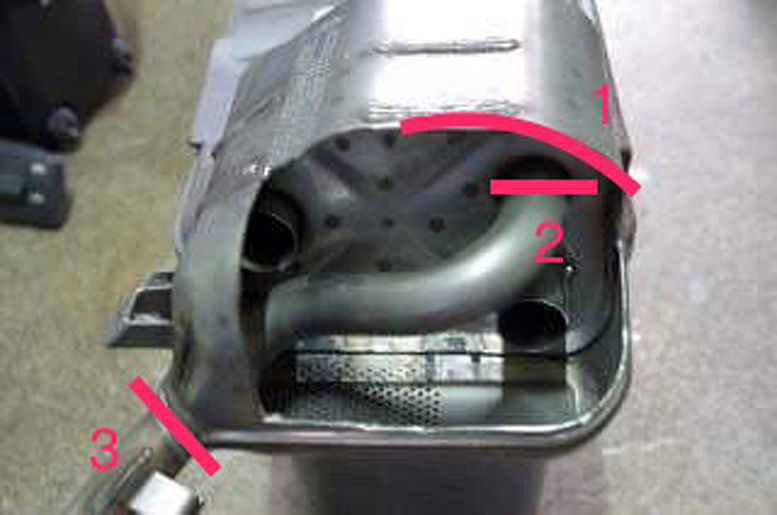 On the XSR forum a guy shows how to extract a fruity noise from a stock system by cutting open the box, excising a section of tube as shown left, adding a bigger bore out-pipe and closing it all up with weld. I like the compactness and partial protection of the under-engine system, but this was all too much work for me with a junior hacksaw and some Chemical Metal. TEC’s XSR system is possibly made in the UK and cost just £260 – the cheapest aftermarket pipe for an XSR as far as I can tell. As I learned with my TDM900, aftermarket pipes are pretty much the same [range of] silencers added to bespoke headers with an O2 sensor to fit your bike. 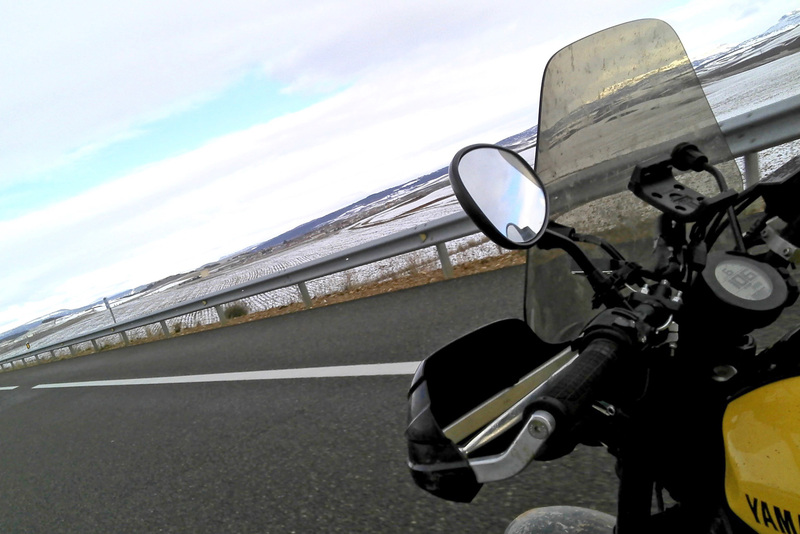 There’s no science or research in finely tuning the entire system to fit your particular machine, but as long as the bike runs much like it did before, most are happy enough with the better sound. 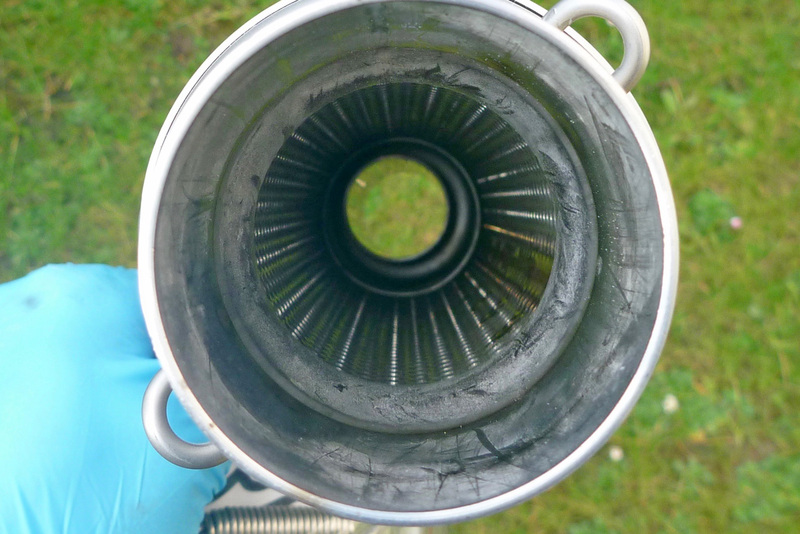 TEC’s silencer is straight-through, like an old Conti, and I worried it might be too loud. Turned out it’s just right to my ears; louder than the Akra but loads better sounding than the stocker. It fitted easily enough; one supplied mounting bolt was way too long and the whole thing sits fairly close to the swing arm. 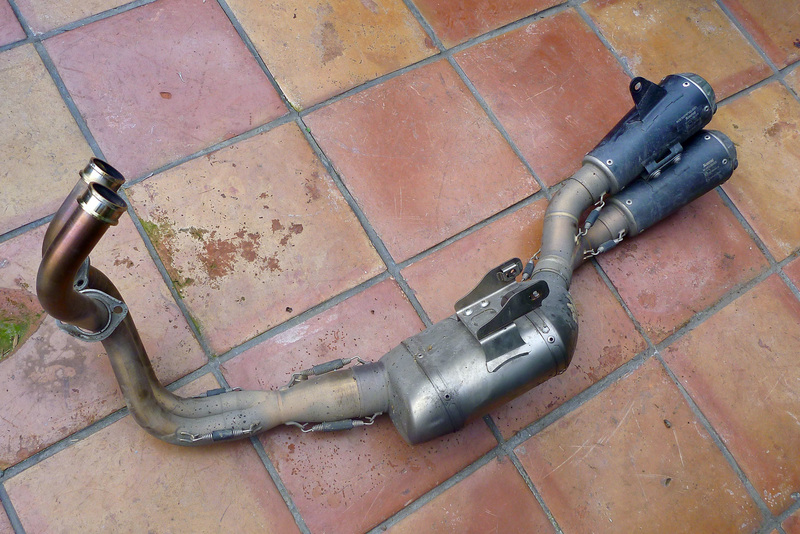 The pipe weighs just over 2.5kg; 4.5kg less than the stock unit which is worth keeping for an MoT. Running through town I didn’t feel it was anti-social, and at 70 on the motorway you can hear the rumble without being worn-down by the racket (compared to the wind noise and all the rest at that speed). Some talk of getting an ECU re-flash; not even sure what that means but no warning lights came on. 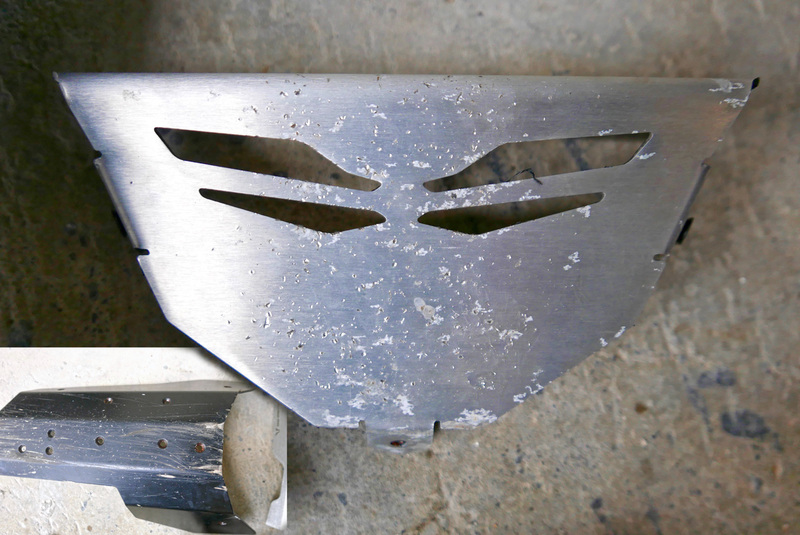 Others talk of running it without the baffle; I wouldn’t consider that for a second. 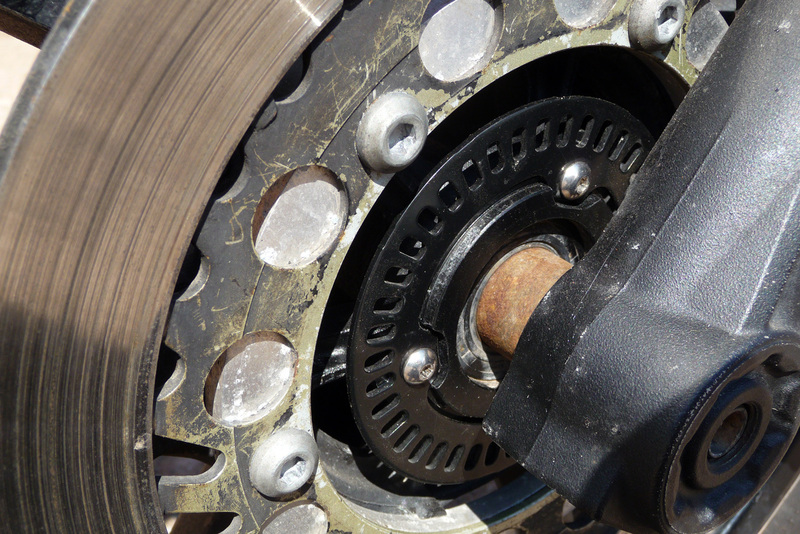 There’s a difference between a good, deep sound and an outright, wince-inducing din. Of course the offset beat on any 270-degree parallel twin like the XSR produces one of the best sounds in biking, so you get a free pass from Neighbours Watch, anyway. Just before going away I rode my now fruity-sounding XSR up to Simon’s who helped do up and then rebuild my XR400 after riding with us in Algeria and more recently in Morocco on the G310GS. Simon (right; more below) likes to engineer and is currently completing an electric-start XR400 as well as a ‘350’ barrel and piston kit’ for a TTR250, his trail bike de choix. 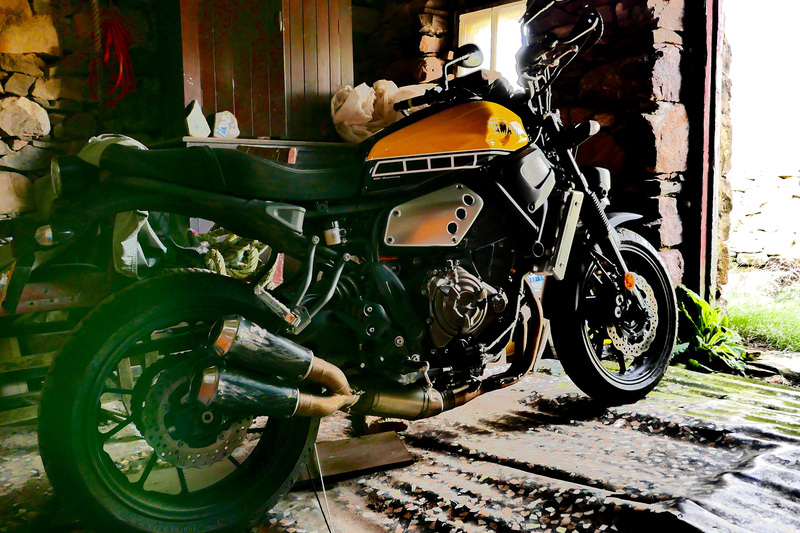 Equipped with a lavish, well-lit workshop and not a humble kerb, he worked out a way to attach the original ABS ring from the XSR front wheel onto my 19-inch XVS950 so the XSR-specific slots communicate via the adjacent sensor and the ECU to make the mildly annoying ‘Warning! ABS-not-working’ light go out. Can’t say I missed ABS, certainly not on the dirt in Morocco, but overall it’s a benefit. 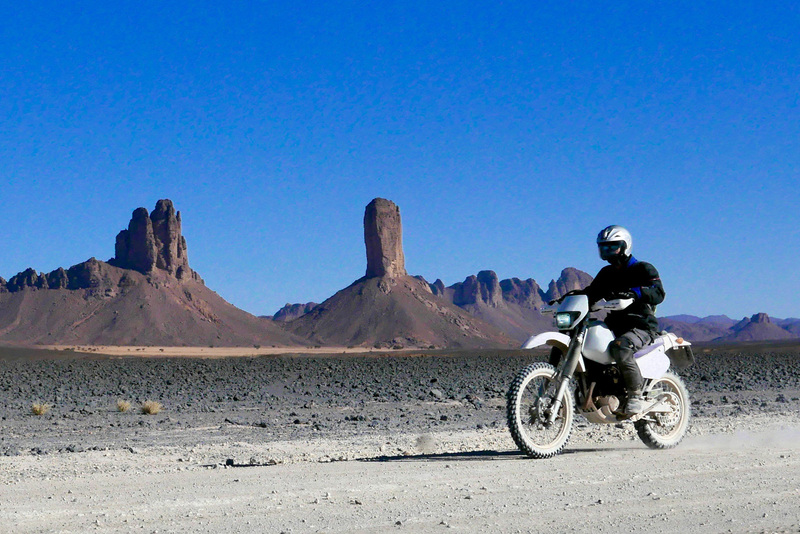 The much reused Spitfire screen I fitted to get to Morocco (right) was too low for long road days and got removed. For the moment Simon mounted a cheapo Puig headlight cowling to cover the wiring exposed by my non-standard LED headlamp. It actually fits pretty well, even if it’ll provide even less protection for the ride down to Algeria this winter. I’ll probably fit something taller or may even Motorail to Marseille, like we used to do. 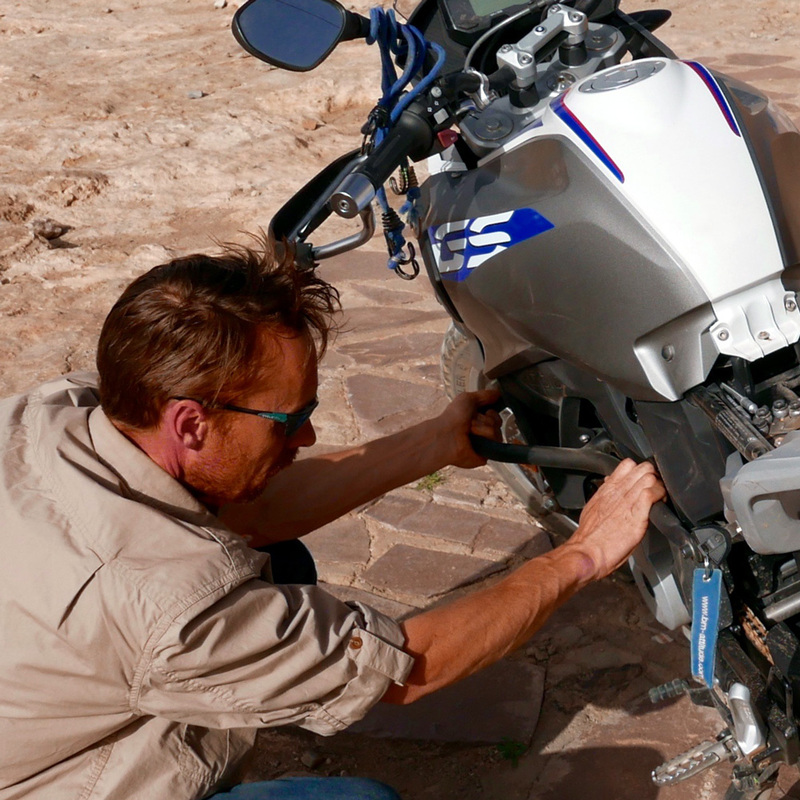 Those inexpensive fork preloaders worked surprisingly well on the stock springs in Morocco and seeing as the bike was OK on the dirt, I also decided to invest in a set of firmer fork springs. They say MT-07s and maybe XSRs too originally came with springs rated too soft at ‘7.8’ Newton somethings. Later they went up to 88 (on MTs only?) but you’ll also read that 90 or even 95 is best. TEC sell XSR progressives for about £110 but flog them with fork preloaders which I don’t need. instead, long-established suspension specialists K-Tech (who we used to fork-up our XR650Ls back in 2003) sell linear-wound coils rated at 9 or 9.5 for £85. For my 93kg I chose the heavier ones. Fyi and to the best of my knowledge the debate over linear vs progressive springs goes like this: linear easier to reliably fine tune for set conditions (good for road racers); progressive better all round but may be hard to get just right. But all this only matters on rough trails or at high speeds. The humble XScrambleR isn’t really native to those categories. 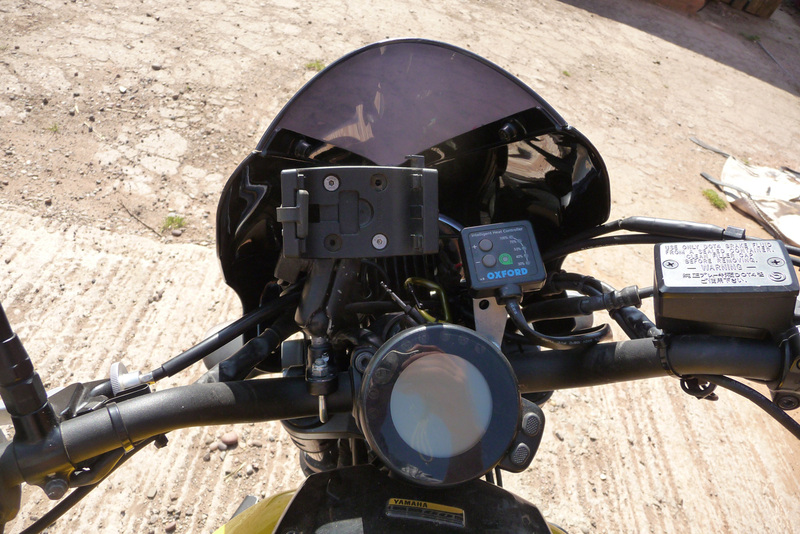 Other jobs Simon did was hardwire my GPS bracket back in and replace last year’s Formica front indicator brackets with neat, all-in-one headlamp mount brackets (above left) from a new wonder material called m-e-t-a-l. Oh, and he properly fitted the trials fender over the front wheel. Well done Simon. I could now sell this bike knowing there are no bodged up loose ends. With all this done I got him to reweigh the bike. 186kg is the claimed wet weight which I seem to recall was on the money. I now have lighter front brakes, a lighter pipe, less weight around the headlight, a heavier front wheel, side stand and probably tyres, plus a tail rack, flyscreen, hot grips and a GPS mount. All that comes in at… 189kg. If it’s your bike, not your teeth we’re talking about then Simon’s you man. Born under a combine harvester (the machine, not the pub chain), 10 years overlanding with Bedfords and Mercs and a now a part-time Land Rover mechanic and metal-bending hobbyist. So anything you offer him will be like a cup of warm unpasteurised milk. I’ve found him meticulous, unflustered and inexpensive; finally someone to implement or finish off odd jobs on my odd bikes. 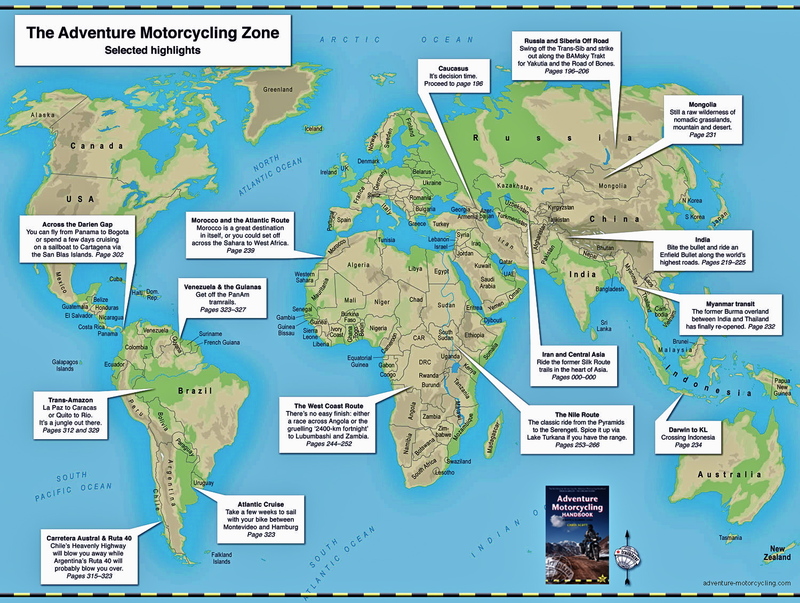 He’s based near Bromsgrove, a mere 31 miles from the geographic centre of England, with space and a farm workshop with all the welding, cutting and tooling gear needed to transform your bike into a galactic battleship or just a street-scrambling hack. Email him with your needs. 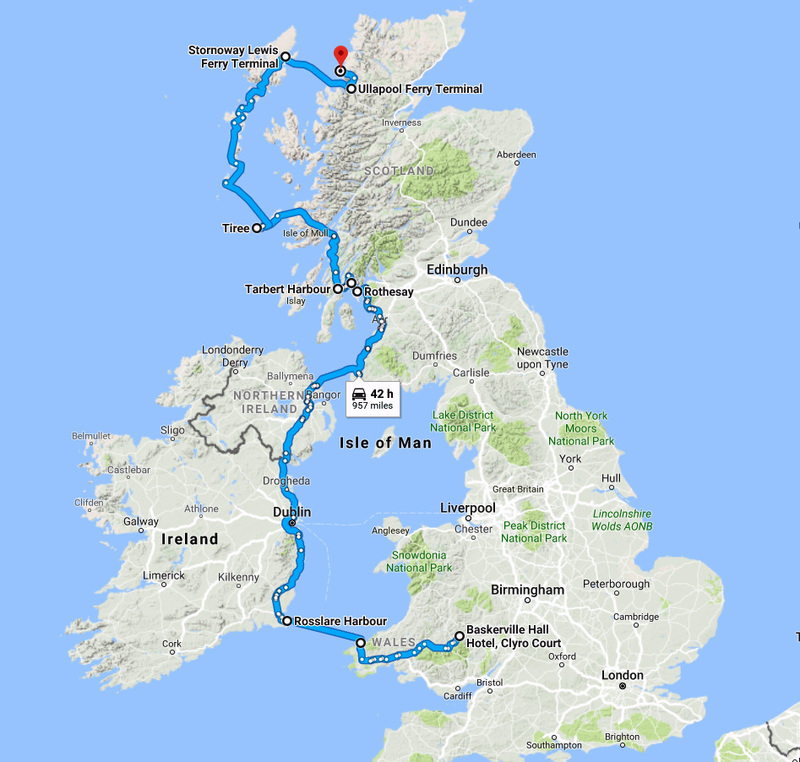 Can’t wait to test out all these mods in June when I ride the XSR from Simon’s over to #HUBBUK18 in Wales, then hook up with my self-styled Marine Highway back to northwest Scotland (right). That, unless I’m very much mistaken, is going to be a great midsummer’s ride. 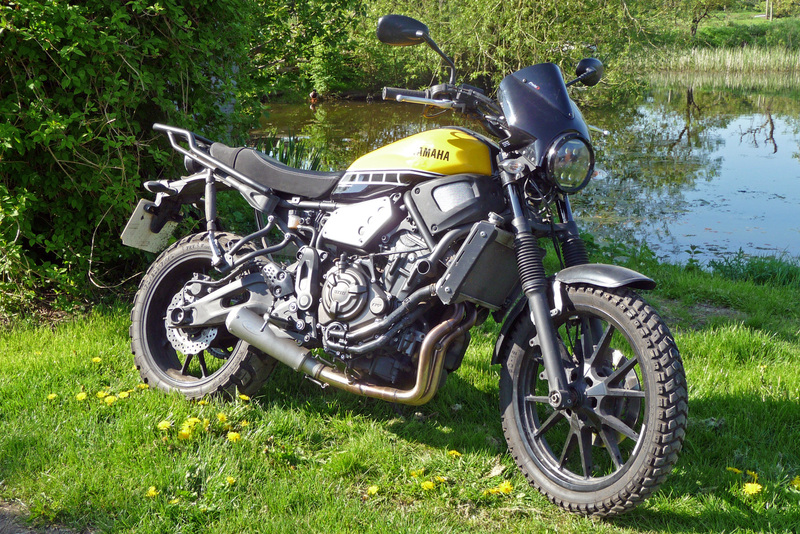 This entry was posted in AMH News, Project XScrambleR 700 and tagged ktech fork springs, linear vs progressive springs, Marine Highway UK, xsr scrambler, xsr700, xsr700 ktech fork springs, xsr700 puig screen, xsr700 tec system, yamaha xsr700 scrambler. Bookmark the permalink.